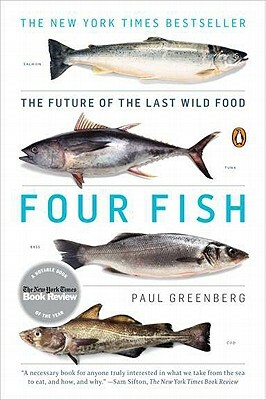 Paul Greenberg is the author of the New York Times bestseller Four Fish: The Future of the Last Wild Food. Four Fish has been published throughout Europe and Asia and was picked by The New York Times, The New Yorker and Bon Appetit as a notable book of 2010. Greenberg has just completed his next work, American Catch: The Fight for Our Local Seafood (Penguin Press, June, 2014) a book that explores why the United States, the country that controls more ocean than any nation on earth imports 90 percent of its seafood from abroad. Mr. Greenberg writes regularly for the New York Times Magazine, Book Review and Opinion Page and also contributes to National Geographic, Vogue, GQ, The Times of London, Süddeutschen Zeitung, and many other publications. He has lectured widely at institutions around the country including Harvard, Yale, Google, The United States Supreme Court and The Monterey Bay Aquarium. Over the last ten years he has been a W.K. Kellogg Foundation Food and Society Policy Fellow, New York's South Street Seaport Museum's Writer-in-Residence and a fellow with the Blue Ocean Institute. He is the recipient of a James Beard Award for Writing and Literature, and a Grantham Prize Award of Special Merit. In 2014 he began a three year Pew Fellowship in Marine Conservation during which he will write "The Omega Principle: The health of our hearts, the strength of our minds, and the survival of our oceans all in one little pill."